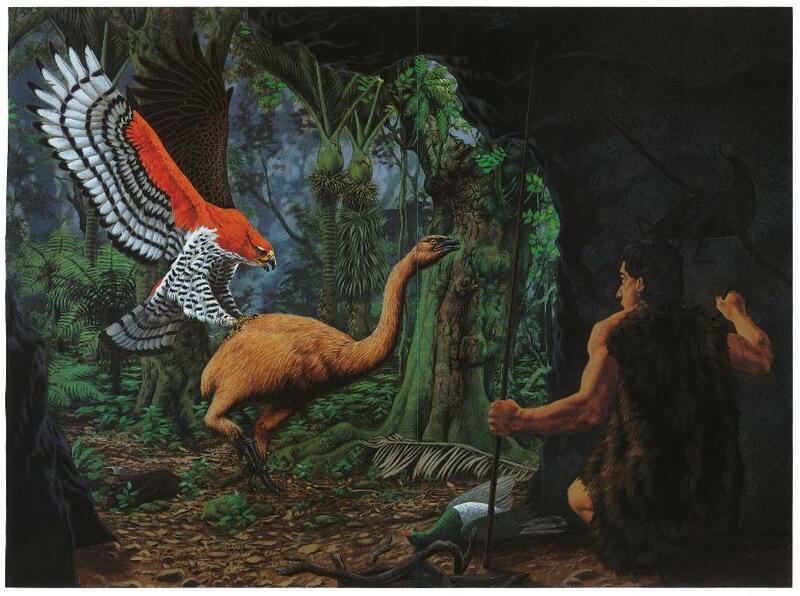 The extinct Giant Eagle, Pouakai, (Harpagornis moorei) preying on an extinct Giant Moa bird. In front of the Maori warrior is a dead Kereru - New Zealand Wood Pigeon. The tree in the foreground, is an old Pukatea Tree, and two Nikau Palms in the centre of the picture. This scene could well have been at Mount Tutu Eco-Sanctuary in the middle ages. In fact, we have Pukatea Tree that are over 500 years old - if only they could talk! Oldest Written Reference - 1866 Military Map names as Te Tutu Hill. Geology - Strata Rhyolite Volcano Symmetrical Cone with terraced hills to North East being the direction of lava flows formed circa 1 - 2 million years ago. Volcanic status - extinct. Mount Tutu Eco-Sanctuary has four Spring fed trickles of water that are the source of the Mangarewarewa Stream which is the high source of the Waimapu River - this then enters the Southern end of Tauranga Harbour at the Waimapu Estuary. The Waimapu Estuary is an important ecological area for birdlife, as a natural hatchery for fish and a significant area for Maori. 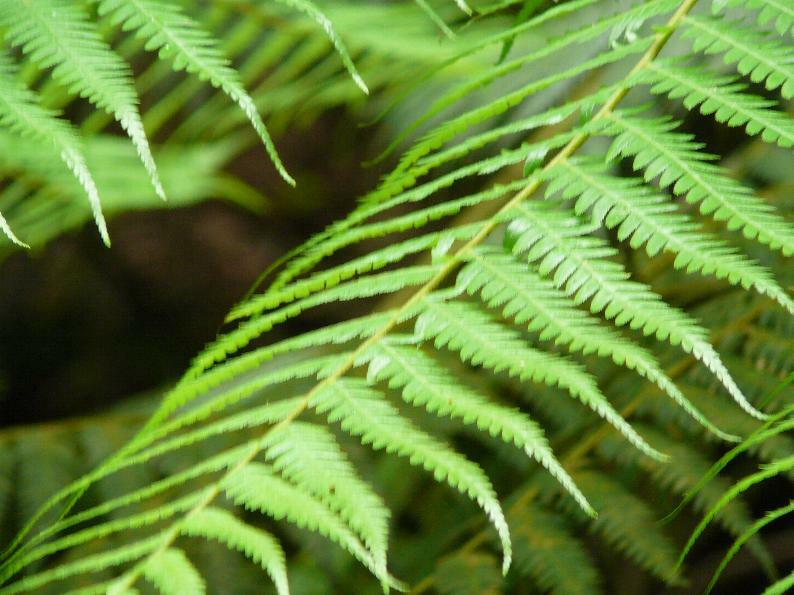 Vegetation - Pre-European, tall stands of Native Rainforest - Currently, this is predominantly confined to the South-Eastern slopes and Mount Tutu Eco-Sanctuary on the North-West with the balance in plantation forest and pasture. Strategic Significance - As High Point overlooking Tauranga Moana and the Pacific Ocean. During World War II 1943 - 45 a Heliograph and Machine Gun was installed at a time when there was a threat of Japanese invasion. Prior to the 1930's the area was unsuccessfully farmed by Pakeha (White Settlers) until it was discovered that the soil was cobalt deficient. As farming life was so difficult, the name Mt Misery became a common usage to reflect that (this continued). These days Mount Tutu Sheep can graze without the atrophy caused by cobalt deficiencies. Journal of the Tauranga Historical Society No 25 July 1965 describes that the original Maori name for this peak as Tu-tai-whata meaning "the high place on the terraced from which the sea can be observed" but that the Ngati Ranginui tribes who lived in this area originally, commonly used the abbreviation "Tu-Tu" for this peak. However, the Oropi News January 1984 records that Maori called this peak Tukutuku which means bird snare, but also confirming that the Mountain is often called Tutu. In 1997 following consultation with Iwi, the Department of Conservation put a sign on the summit "Maungatutu (Mt Misery)". "Maunga" means mountain, or alternatively Mount Tutu as in Mount Tutu Eco-Sanctuary and as used by others. It was not uncommon for different Maori Hapu (sub tribes) e.g. Ngati Rangiwewehi, Ngati Ruahine etc. to have different names for features, but the name that was constant, was "Tu-Tu" and "Tutu". Mount Tutu would also have been a great strategic vantage point for the early Maori to observe and for locating the giant Moa bird before sending out a hunting party. The Moa was a flightless bird up to 3 metres tall which was unfortunately hunted to extinction. New Zealand (Aotearoa) also once had a giant Eagle known as Haast's Eagle or Pouakai which at 13 kilograms would have been the largest bird of prey the world had seen and used to prey on Moa. The bones of this giant bird of prey have been found on both North and South Island usually with Moa bones suggesting that sometimes both were the loser. There is sufficient evidence, including Maori legend, that Pouakai still existed after the arrival of the Maori who arrived about 1300 AD. Just imagine this giant Eagle soaring, catching the updrafts and downdrafts around Mount Tutu, just as the Harrier Hawke's do today! The nocturnal Kiwi bird now rare in the region, would have once been very common. Unlike the Moa, the Kiwi was revered and protected by the Maori and only the Chief wore a cloak of Kiwi feathers. Twenty years ago, before the establishment of the Sanctuary, there were Kiwi. It is the goal of Mount Tutu Eco-Sanctuary to Predator fence the Sanctuary so that once again the haunting shrill of Kiwi rings out to join the Tui, Kereru, Bellbird, Morepork, and the many other enchanting birds. Mount Tutu and its surrounding Bay of Plenty region, so named by Captain James Cook because of the generosity of the local Maori, had a large pre-European indigenous population. Following the 1864 Battle at Gate Pa, between British Troops and Maori, there was significant land confiscation - this did not extend to Mount Tutu which was the Ohauiti No 2 Block as this was sold by Maori and is recorded as "Private Purchase". There are nearby registered Maori Pa (fortress) sites and other archeological formations, it is though a pity to observe unregistered sites being destroyed. One nearby significant Pa and cultivation site was the Waioku Pa on the south-western side of Mount Tutu. In 1993 the Sanctuary was covenanted by the Queen Elizabeth II National Trust Act which ensures legal protection in perpetuity. In 1988 the Short Family established and has maintained active predator control to protect the birdlife, conservation programmes and education tuition by Tim (a former Mountain Safety Council Bushcraft Instructor). Mount Tutu Eco-Sanctuary has Pukatea Trees over 500 years old and Tim and Debbie Short are Life Members of the Queen Elizabeth II National Trust, along with their daughters Rebecca, Jacinda and Louisa who will be lifelong nature lovers!